Please join your local voluntary fire brigade. At present we have a vacancy for 3 volunteer Firefighters. 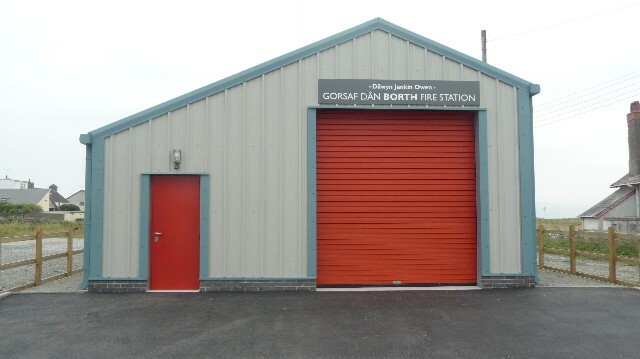 Borth is one of only two Fire Stations in England and Wales manned entirely by volunteers. We have a L4P 4x4 Ford Transit appliance to respond to incidents, carrying a pump, 80 gallons of water, and various other fire fighting equipment. We are turned out to about 25-40 calls a year ranging from flooding, horses in ditches, road traffic accidents, as well as fires. We are part of Mid and West Wales Fire Brigade - Ceredigion - We cover an area between Furnace to the North and Rhydypennau to the South, covering Tre'rddol, Taliesin and Talybont. However, along the way, we have met a considerable number of obstacles and our goal was beginning to seem unattainable. We are grateful to Mr. Gareth Rowlands, High Sherriff of Dyfed for 2009 - 2010, who nominated Borth Volunteer Fire Unit as his personal charity. May I thank him for his endless patience and dogged persistence in helping us overcome many obstacles. The official opening of the new fire station was at 2pm on Thursday 28th July 2011. by Lord Elystan Morgan. The fund raising has still not finished as money will still be required for the running of the station. Please contact -Brian Boot on 07791500983 Chairman Friends of Borth Fire Service.